Leather conference folders, ring binders, folios and zipped folders, all offered with free branding or personalised by way of laser engraving. 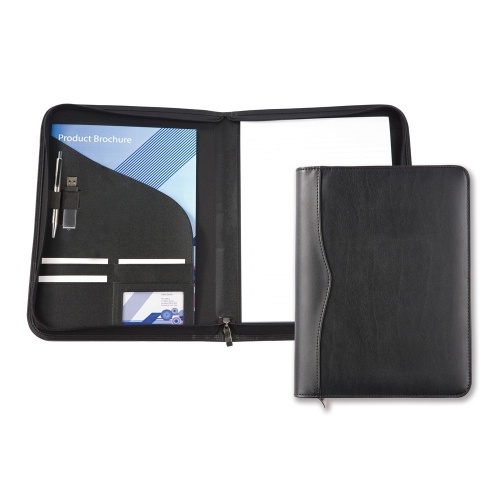 A top quality A4 zip around conference folder in lightly-padding black Belluno leather with stitching. Includes lined pad. Quality conference folder, lightly padded with stitched detail and full zip round closure. Includes lined pad, multiple slots & pockets. 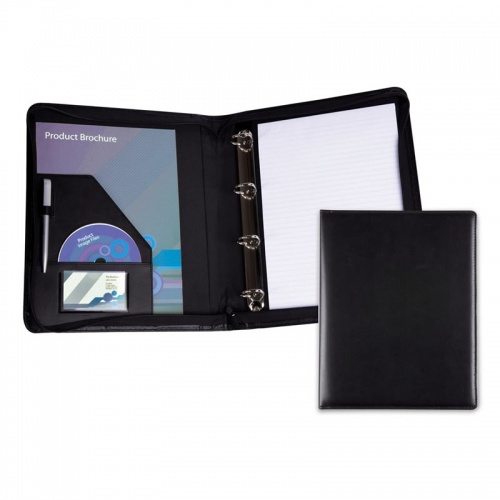 Quality conference folder in black PU leather with zip round closure, suitable for A4 sized documents. 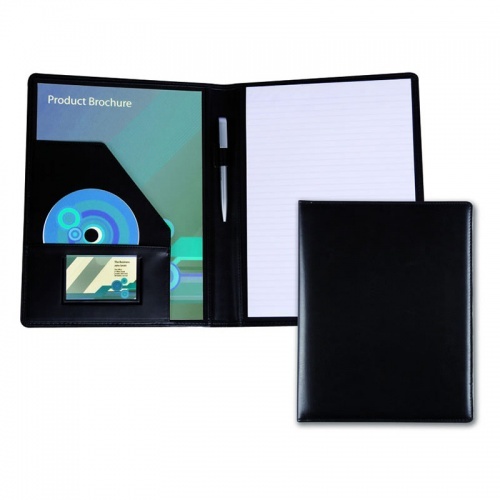 A5 conference folder complete with lined pad and also featuring large internal sleeve, pen loop and business card window. 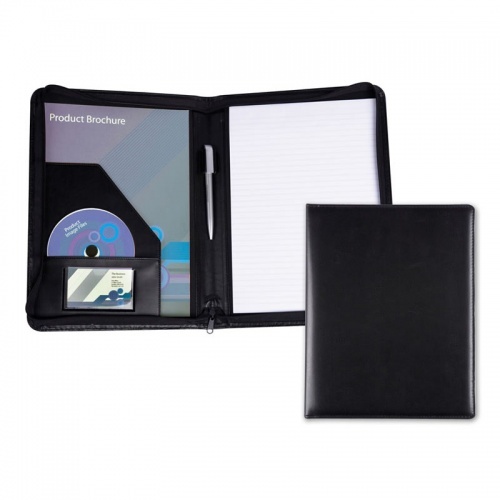 A5 zip round conference folder complete with lined pad and also featuring large internal sleeve, pen loop and business card window. 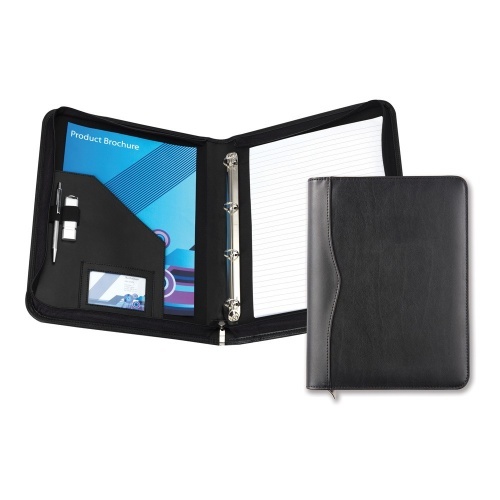 A4 ring binder folder complete with lined pad and also featuring large internal sleeve, smaller internal sleeve pen loop and business card window. 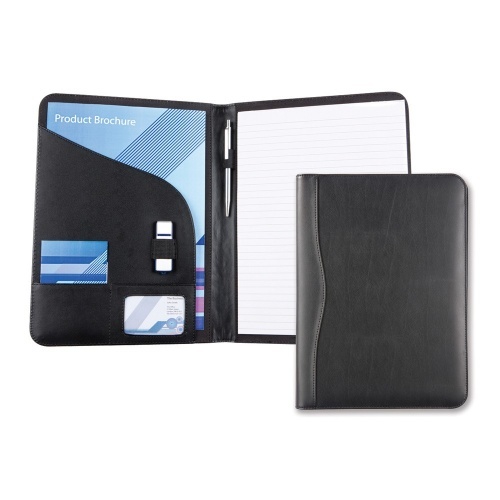 A4 conference folder complete with lined pad and also featuring large internal sleeve, smaller internal sleeve pen loop and business card window. 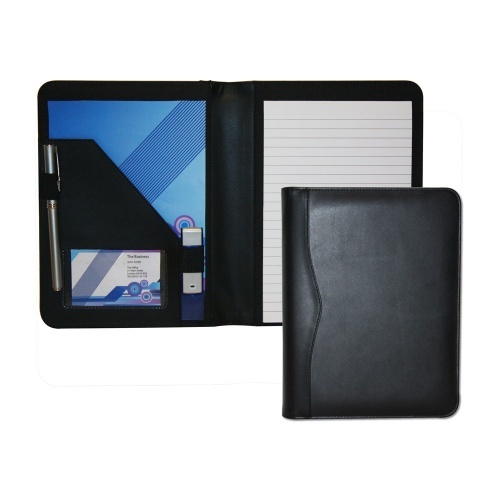 A4 zip round ring binder folder complete with lined pad, large internal sleeve, pen loop and business card window. Quality A4 conference folder in black 'Houghton' PU leather with stitched edges. Includes fitted lined pad, interior pockets and loops. 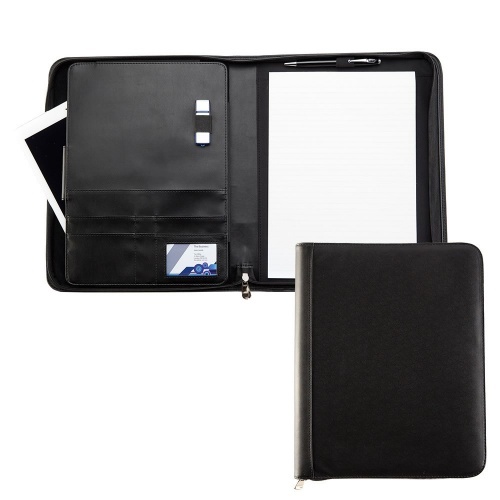 Zip round A4 conference folder with padded internal pocket for tablet or netbook. Includes fitted lined pad. A4 ring binder with zip round fastener, in black 'Houghton' PU leather with stitched detail. Includes internal pocket and loops for pen/USB stick. 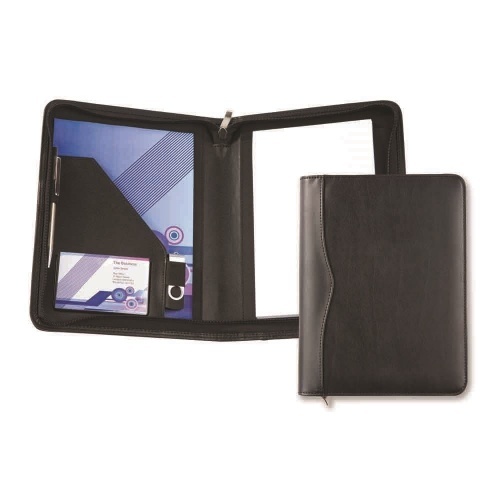 Quality A5 zip round conference pad holder in black 'Houghton' PU leather with stitched edges. Includes fitted pad, pen/USB loops and large internal sleeve. 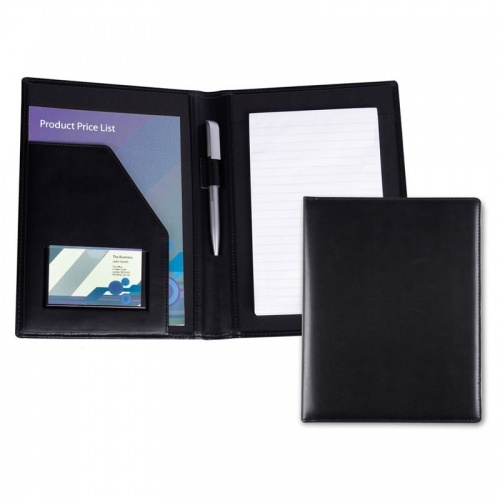 A5 conference pad holder in black PU leather with stitched edges, scalloped spine and lightly padded cover. Includes lined fitted pad. 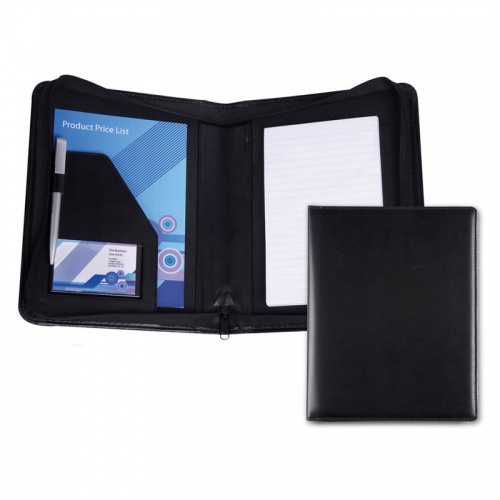 A4 zipped conference folder complete with lined pad and also featuring large internal sleeve, smaller internal sleeve pen loop and business card window.